The bowline can be tied quickly and is easy to adjust. 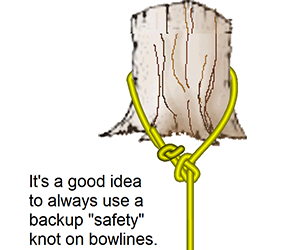 It is also very easy to untie, so the tail should always be secured with a backup knot (e.g., an overhand knot). 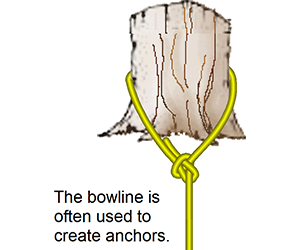 The bowline can be a little difficult for novices to learn, but it is easy to remember with a little practice. 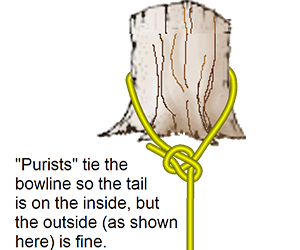 Some people learn to tie a bowline using the memory aid, "The rabbit comes out of its hole, goes around the tree, and goes back down its hole." If that works for you, use it! If you design, teach, or test rigging, you should own vRigger.